Sgt. Michael D. Kirspel Jr. Hometown: Hopatcong and Keyport, NJ. Died: October 27, 2010 in Operation Enduring Freedom. 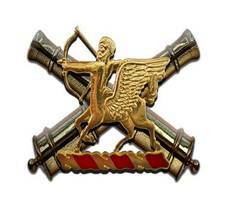 Unit: 3rd Battalion, 6th Field Artillery (Strike), 1st Brigade Combat Team,10th Mountain Division, Ft. Drum, N.Y.
Sgt. Michael D. Kirspel Jr., 23, of Hopatcong, N.J., died Oct. 27 near the village of Khwaja Kinti (approximately 25 km south of Ghormach), Afghanistan, of wounds suffered when insurgents attacked his unit using an improvised explosive device. He was assigned to the 3rd Battalion, 6th Field Artillery (Strike), 1st Brigade Combat Team, 10th Mountain Division, Fort Drum, N.Y. Survived by his mother: Dawn Roberts and her husband: Christopher T. Roberts, Sr., father: Michael D. Kirspel, Sr. and his wife: Josephine, brother: Samuel J. C. Roberts, paternal Grandparents: Jean and Walter Kirspel, step-Brother: Christopher T. Roberts, Jr., step-Sister: Carissa Incorvaia and step-Brother: Christopher Menendez. Family and friends of Sgt. Michael D. Kirspel spoke of a young man proud of his three tours of duty spent defending his country, but with a heart that never left home. "He would always find a way to get to a phone as he was deployed, just to make sure everyone (at home) was all right," said his mother, Dawn Roberts, choking back tears. "He was a guy you could always count on. He had an amazing moral standard. And he was so protective to his little brother (Samuel), who has cystic fibrosis. "Now this world is now at a loss for not having him in it," said Roberts, of Stanhope. "We will never be the same." On Wednesday, Kirspel, 23, was killed fighting for Operation Enduring Freedom in Afghanistan when insurgents attacked his unit using an improvised explosive device. Kirspel, who graduated from Hopatcong High School in 2006, had previously served two tours in Iraq from Oct. 2007 to November 2008. His four-year enlistment with the Army was set to expire in March, according to close friend John Davis. "We were planning on getting a house together," said Davis, 24, of Stanhope. "He was worried about where he was going to live, but he wanted to stay close to his friends and family. We were going to have it all set up." Kirspel, who was from Stanhope, was the 27th service member with ties to New Jersey to die in Afghanistan since the war began in 2001. Nearly 100 others from New Jersey have died in Iraq since the U.S. invasion in 2003. Just last week, Lance Cpl. Francisco R. Jackson, 24, of Elizabeth was killed in Afghanistan, also by an improvised explosive device. Since the invasion of Afghanistan in late 2001, 1,250 members of the U.S. military have died, according to the Department of Defense. The attack that killed Kirspel occurred near the village of Khwaja Kinti, approximately 25 kilometers south of Ghormach, the Defense Department said. 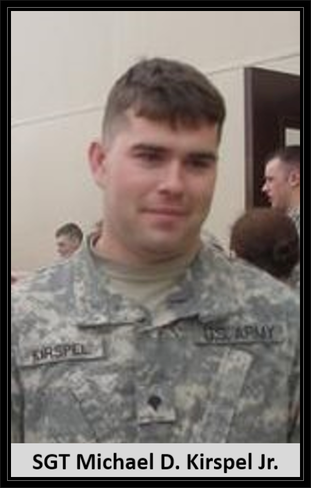 Kirspel was assigned to the 3rd Battalion, 6th Field Artillery (Strike), 1st Brigade Combat team, 10th Mountain Division, Fort Drum, N.Y.
Kirspel’s family and friends said serving in the Army was a dream he had since he was a boy. "We tried to talk him out of it," Roberts said. "But he was not being talked out of it." "Being in the Army was something he always wanted to do," Davis added. "I know he was young, but the Sept. 11 (2001) attacks had hit him hard." "He knew he was over there for a purpose," said Kaceylee Sowinski , another friend of Kirspel’s who had just spoken to the fallen soldier earlier this week. "That was the whole reason he signed up with the Army — to make a difference." Kirspel’s father could not immediately be reached tonight. But on Michael Kirspel Sr.’s Facebook page, the following post was written: "To my son, my Hero, always in our hearts forever. I have lost a son, my best friend. We will be together one day. You’re with God now. I am sure it’s a better place. You gave your all for your country, but left us here with heavy hearts. Always in my heart, Love, Dad. Kirspel was a cannon crew member who deployed to Afghanistan this past spring. He previously had been stationed at Fort Campbell, Ky. He arrived at Fort Drum in September 2009. Kirspel received several awards and decorations during his tenure, including the Army Commendation Medal with Valor, the National Defense Service Medal, the Afghanistan Campaign Medal, the Iraq Campaign Medal, the NATO Medal, the Global War on Terrorism Service Medal, the Army Achievement Medal, the Army Service Ribbon, the Overseas Service Ribbon, the Combat Action Badge, the Marksmanship Qualification Badge and the Driver Mechanic Badge. Michael Dana Kirspel Jr. was born on July 8, 1987. "Krispy," as his friends called him, was known for his good nature and being an avid outdoorsman. "He was into hunting and maybe firing off a few rounds," Davis said. "He was really into off-roading with a truck or quad-riding. He always wanted to get a motorcycle, but he would always use his Dad’s." While attending Hopatcong High School, Kirspel also had a shared-time apprenticeship at the Sussex County Technical School in Sparta, where he specialized in welding. "He was really into automotive stuff," Davis said. "We would rebuild cars a lot. Welding was his skill." Roberts said arrangements for her son were pending the arrival of his body at Dover Air Force Base in Delaware. "He was a very genuine person," Sowinski said. "He always thought of everyone else before he thought of himself. He was just a beautiful person." "Michael’s life should very much be appreciated and we celebrate that we had him," Roberts said. "We brought us immeasurable joy and love and pride. But life will never be the same without him." Sgt. 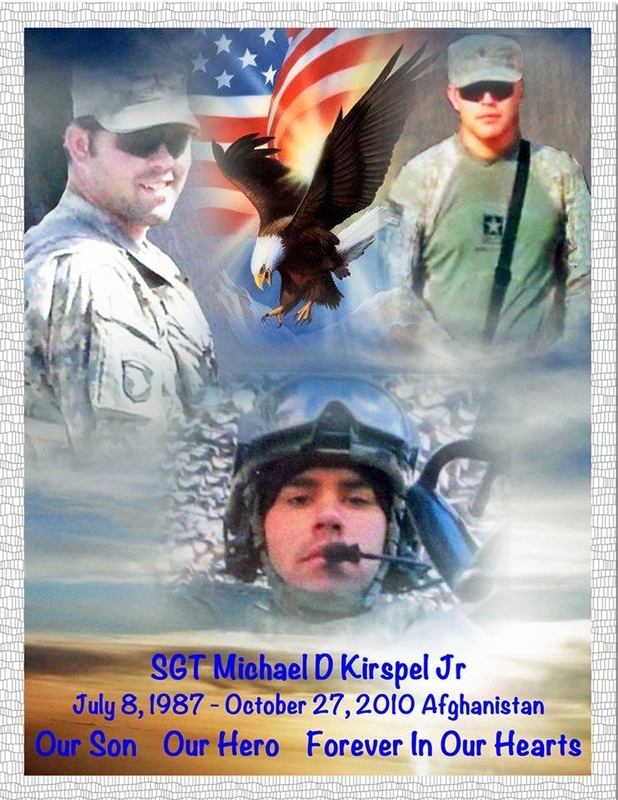 Michael D. Kirspel Jr. passed away on Wednesday, Oct. 27, 2010, from injuries sustained from an improvised explosive device near the Village of Khwaja Kinti, Afghanistan. He was 23. Visitation will be held on Friday, Nov. 5, 2010, from 5 to 9 p.m. at the Bermingham Funeral Home, 216 S. Main St., Wharton, N.J. Funeral service will be held Saturday at 10 a.m. at the funeral home. Interment will follow at St. Mary's Cemetery, Dover, N.J. Born in Dover, N.J., on July 8, 1987, Sgt. Kirspel lived in Hopatcong and Keyport, N.J. He was a 2006 graduate of Hopatcong High School and also attended Sussex County Technical School, specializing in welding. Sgt. 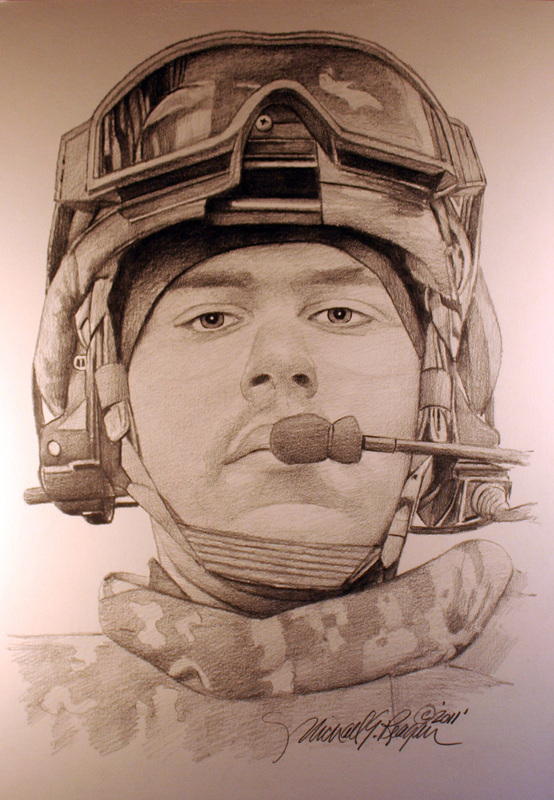 Kirspel enlisted in the U.S. Army in 2005 and was attached to the 101st Airborne Division, Fort Campbell, Ky., and most recently, the 10th Mountain Division, Fort Drum, N.Y. He received several awards and decorations during his tenure, including the Army Commendation Medal with Valor, the National Defense Service Medal, the Afghanistan Campaign Medal, the Iraq Campaign Medal, the NATO Medal, the Global War on Terrorism Service Medal, the Army Achievement Medal, the Army Service Ribbon, the Overseas Service Ribbon, the Combat Action Badge, the Marksmanship Qualification Badge and the Driver Mechanic Badge. He was awarded the Purple Heart Medal posthumously. "Krispey," as his friends called him, was an avid off-roader with a truck, motorcycle or quad. He enjoyed music, rebuilding cars, but especially the military. He was a member of Grace-The Church on the Mount in Netcong. He is survived by his mother, Dawn Roberts, and her husband, Christopher T. Roberts, Sr. of Hopatcong; his father, Michael D. Kirspel, Sr. and his wife, Josephine, of Keyport, N.J.; his brother, Samuel J. C. Roberts (age 6) of Hopatcong; his paternal grandparents, Jean and Walter Kirspel of Woodstock, Ga.; his step-brother, Christopher T. Roberts, Jr. of Hackettstown, N.J.; his step-sister, Carissa Incorvaia of Fort Huachuca, Ariz.; his step-brother, Christopher Menendez of Fort Leonard Wood, Mo. ; he is also survived by aunts, uncles, nieces, nephews, cousins and many friends. In lieu of flowers, donations in his memory in honor of his brother, Samuel J.C. Roberts, to the N.J. State Organization of Cystic Fibrosis, P.O. Box 3648, Wayne, N.J. 07474-3648 (NJSOCF.ORG) would be appreciated. Offer condolences at www.BerminghamFH.com.